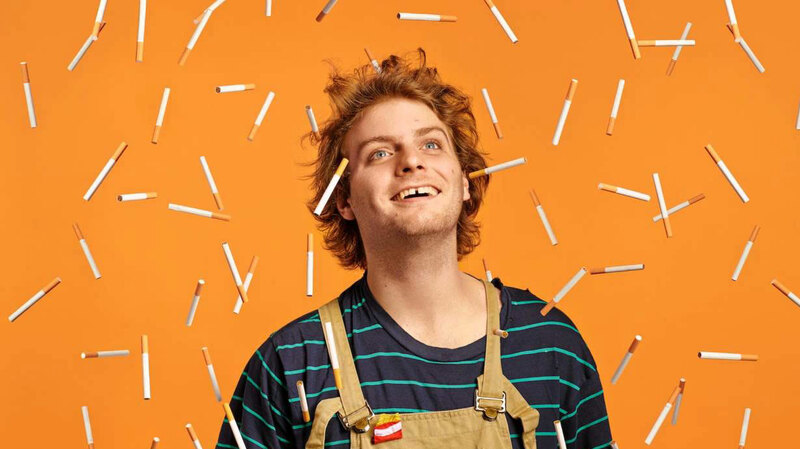 The critics might have branded his music “slacker-pop” but there’s no knocking Mac DeMarco’s work ethic: latest LP Salad Days was written and recorded in little more than a month. We called the singer-songwriter at home, in his apartment in Brooklyn, to find out more about it. Your profile’s grown a lot since the release of 2. Did that put you under any pressure when writing Salad Days? There was a lot of pressure, but I kinda just tried to forget about it. Because it only drives you crazy if you don’t, and it’ll only end up making you write a really bad album. But Salad Days came together pretty quickly, right? That’s right, yeah. I wrote and recorded it all on my own, in my bedroom in Brooklyn in the month of September, when I had been touring right before. And then I went back on tour straight afterwards… It was a bit stressful to make but I’ve liked it ever since I finished it. I’ve had a couple of extreme responses. A kid pulled all of his hair out at a show in Rome. Sonically, what was the goal for Salad Days? I kept it sonically pretty much similar to 2 but I did want to try a couple of new things. Like, I tried playing the keyboard a little bit, because I was sick of playing everything solely on guitar. I think ‘Chamber Of Reflection’ is my favourite track because of [the keyboards]. I’d been listening to a lot of weird Japanese music, like Yellow Magic Orchestra. But I think what sets this album apart from the last one is more the concepts of the songs; the actual content of the lyrics. It’s a little more personal. I wrote about very specific things, instead of being like “Blah, blah, blah, love song”, like I did on the last record. What was the trigger for you opening up? I think it was just the circumstances. I hadn’t had the chance to decompress since being on the road so, getting back home, it was like all of reality came back in a rush, all at once, and I didn’t really know what else to write about. I mean, I didn’t really want to tell people what to do, or write about something I don’t really know anything about, so the only thing I know to write about is my life, I guess. That honesty is reflected in some quite downbeat lyrics, at times. Like on the song ‘Salad Days’, for example. Well that song is kinda a call and response statement, I think. At the beginning of the song, it’s me complaining and being a jaded little pr*ck about having all this stuff happen and being tired. But the lyrics in the chorus are more or less me trying to shake myself out of that, because there’s no use being a little jerk at 23. Playing the songs live can be a little bit weird, because it was a bit scary to put out some of the stuff that I’ve expressed in the songs. But that lack of façade is what appeals to audiences: people feel like they know you. Is there a divide between your public and private personas? Well, obviously there’s a little bit, but also I think different aspects of my character are accentuated in the public. I mean, everybody is multi-faceted. I think a lot of it is what the press and people decide to hone in on. But it is amazing how some people know about my personal life before they even meet me. Maybe it’s my fault? Either way, it means you have incredibly enthusiastic fans. We saw you play in London last year, and the crowd were going crazy. Is that sort of response the norm? Usually, I think. It depends on where, but a lot of the time the kids are pretty excited. We’re lucky they get so into it. I think me and my band make people feel comfortable, especially young kids, and that makes me happy. Is that intensity mirrored in your encounters off stage with fans? Have you had any strange experiences? Yeah, I’ve had a couple of extreme responses. A kid pulled all of his hair out at a show in Rome. He was kicking and [the paramedics] had to come give him a shot and take him away in an ambulance, so that was pretty weird. But I enjoy meeting people. I mean, actually meeting people – not just meeting kids and signing their records. So that’s one thing that gets me through long tours. That and alcoholism: I’m always drunk when we play. So what’s the plan for the rest of 2014? We’re going to be touring and then the plan will be to take some time to write some more music. Hopefully, in a less rushed environment. Beyond that, what are you driving towards? That’s the thing: I’ve always had another place that I’ve wanted to get to, but I don’t now. I mean I’d love to see more of the world, and go to Japan and Russia. Basically, anywhere I could possibly play I’d love to. But the idea of us playing rooms bigger than this? I’m not sure. I’m not interested in the money, and I think the rooms we’re playing right now are probably the ideal size. To play a 5,000-person room? I think I’d be so disconnected from the audience, I don’t even know I’d like it.